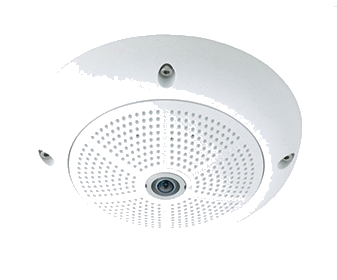 The Mobotix Q25M Hemispheric camera is an elegant, ultra-compact and weather proof IP network dome camera with a special hemispheric lens (fisheye). 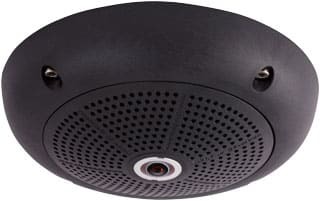 When mounted on the ceiling, the camera is capable of providing full 360° allround view or a 180° widescreen panorama when mounted on a wall. With innovative Mobotix Hemispheric Technology, an entire room can be ideally monitored. For instance, one single, particularly elegant and discreet, Q25M replaces the time-consuming and expensive installation of several standard cameras. The overview image provided by a single Q25M, which may be tailored in a number of ways according to specific user requirements, not only reduces the number of required cameras, but also minimizes the system costs by reducing the wiring complexity, emergency power requirements and number of recording devices required. Thanks to the fact that a 6-megapixel night sensor module MOBOTIX camera is now able to deliver high-quality images on full moon nights (illumination of approx. 0.25 lux) without any additional lighting, this new moonlight technology is suitable for applications with illumination levels below 5 lux (in comparison, street lighting seldom drops below 10 lux). For scenarios with normal lighting conditions, such as illuminated indoor and outdoor areas, the available 5-megapixel camera models are sufficient.